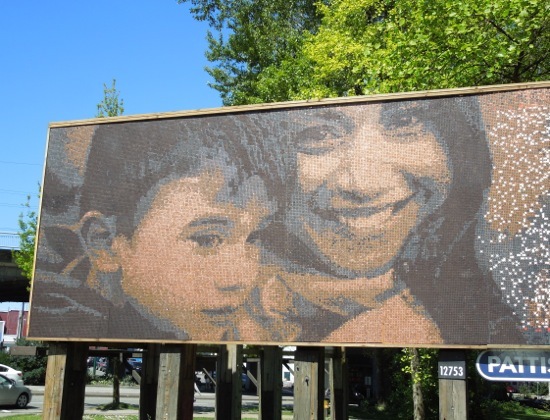 Daily Billboard was in Vancouver, British Columbia at the weekend to run the Vancouver Marathon and spied this fantastic billboard installation made from pennies. 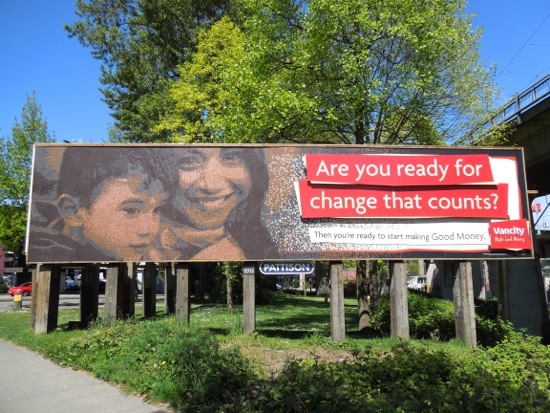 Compared to L.A. there's really not much billboard advertising around the streets of Vancouver, so this fabulous creation for Vancity credit union stands out even more. 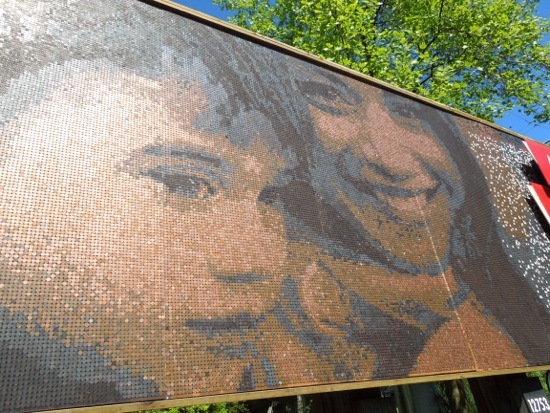 The eye-catching billboard is made up of around 61,000 out-of-circulation Canadian pennies all sorted into different colours and tarnish level to create the desired mosaic effect. As well as being visually interesting, it's also a topical initiative, as in March 2012 the Canadian government announced the penny would no longer be produced as currency and in February 2013 the Royal Canadian Mint stopped making and distributing the coin as part of federal budget cuts. 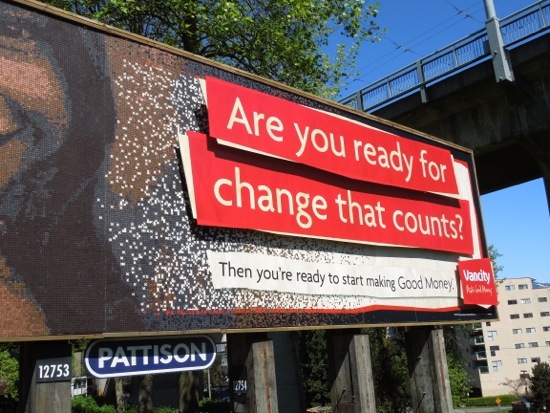 Apparently this penny billboard was conceived for Vancity by Wasserman + Partners Advertising and was assembled with the help of Starworks, which provides employment for those with developmental disabilities. 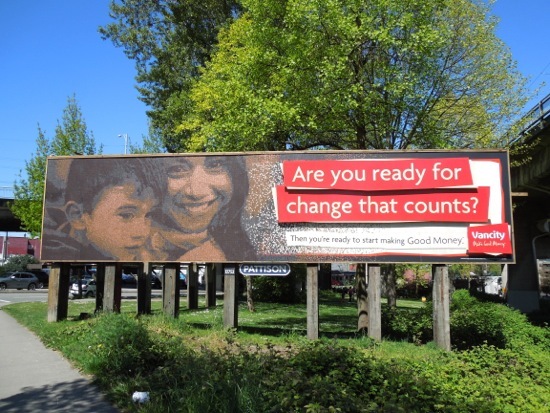 You can also take a closer look at how this creative billboard was made in this video. 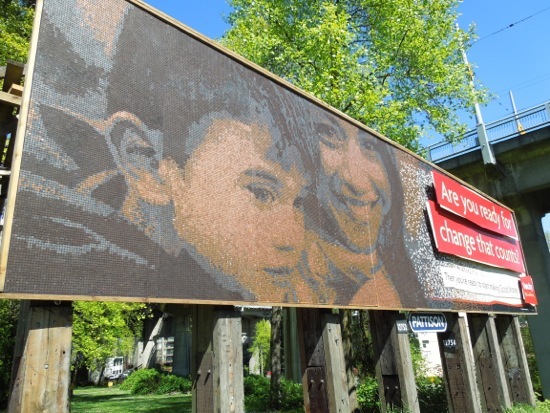 This mosaic billboard made from the humble penny was snapped along 4th Avenue and Granville Street (at the main entrance to Granville Island) on May 4, 2013. 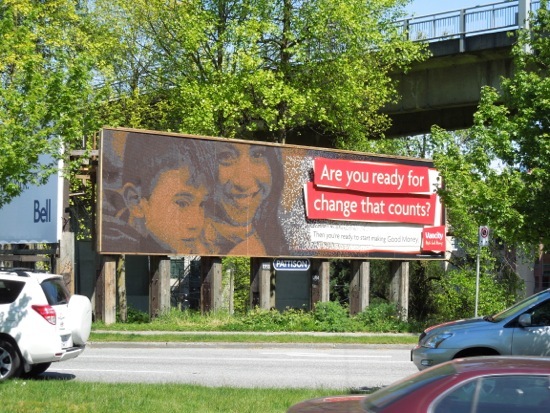 If you like this, be sure to also check out this Vancouver Aquarium special jellyfish installation billboard from the same location in August 2011.